Golden Raisin No Bake Energy Bites just made it official—it’s Shove This Into Your Mouth Week. I hadn’t planned share these no bake energy bites until next week, but after consecutively posting Moroccan Turkey Meatballs and Cranberry Baked Brie Puff Pastry Bites, it seemed wrong to deny us all one more delectable excuse to shove an entire ball of goodness directly into our mouths. The inspiration for this recipe was the outrageous quantity of golden raisins that mysteriously appeared in my pantry. For whatever reason, I habitually believe that I am out of certain ingredients, which is how I wound up with enough black beans and cumin to sustain a chili diet through the Wisconsin winter. Judging by the three bags of unopened golden raisins on my shelf, I clearly harbor deep fears of running out dried fruit as well. These no bake nutty and fruity bites began with intentions to make a healthy sweet, truffle-inspired treat and wound up with something so all-together wholesome, they are absolutely acceptable as a snack. (Kind of like these Salted Caramel Truffles!) Comprised of only natural sugars from the golden raisins and honey, boasting healthy fats and omegas-3s from walnuts and flaxseeds, and a boost of fiber from whole grain oats, these little balls of chewy sweetness pack a big nutritional punch. In addition to being healthy, this energy bite recipe is sweet enough to pass for a real dessert. I want to kiss every single one of them—then immediately take a giant bite. If you are not a big raisin fan, fear not—these no bake energy bites taste nothing like the hard raisin nuggets that lurk at the bottom of your breakfast cereal. The golden raisins—which are much milder in flavor than purple raisins—add body and sweetness, without overpowering the other ingredients. 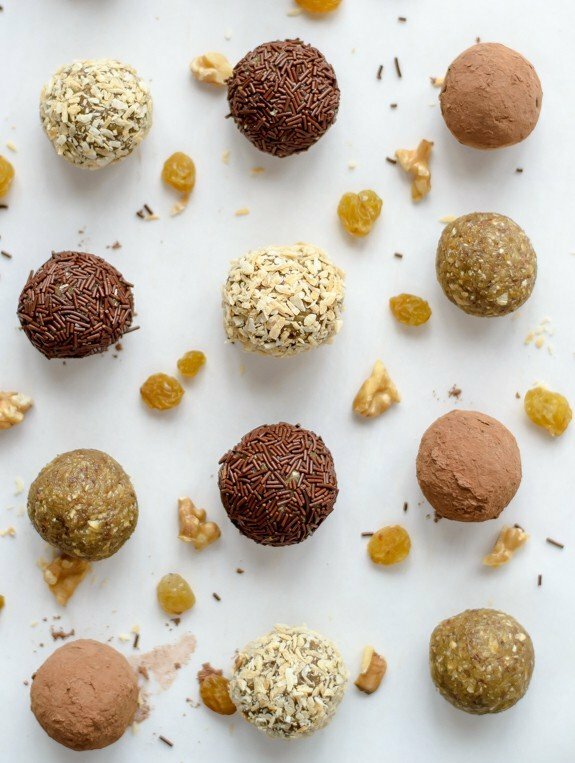 If you’re interested in even more mix-in options, this Energy Balls recipe was made for all sorts of flavor adaptations! Whether you pop a Golden Raisin Truffle for a mid-day pick-me-up, post-workout snack, or healthy dessert, you’ll revel in the fact that eating something this good for you can taste this good too. I think I need another bag of golden raisins. Sweet and chewy healthy treats made with golden raisins, walnuts, and oats. Eating something this good for you has never tasted so good too! 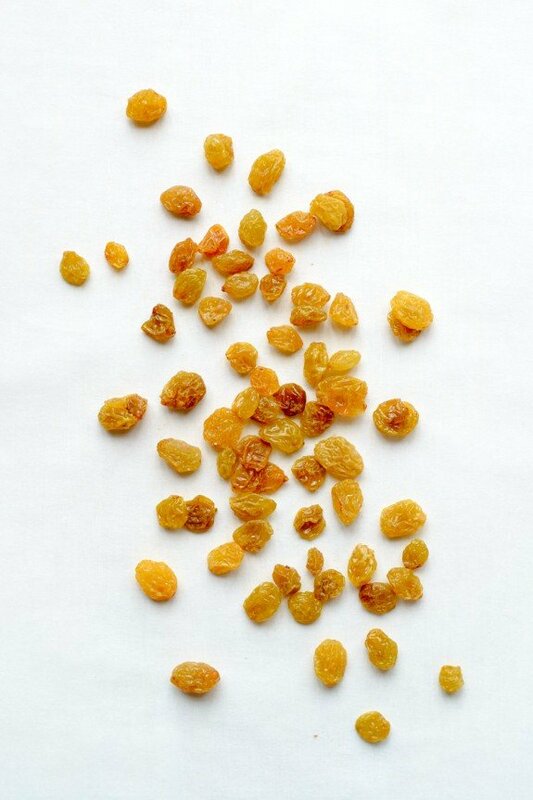 Place the raisins in a small bowl and pour very hot water over the top to cover. Let sit 5 minutes, then drain and lightly pat dry. Place the nuts, oats, and flaxseed in the bowl of a food processor fitted with a steel blade, then blend until finely ground. Add the drained raisins, honey, vanilla extract, and salt. Pulse until a thick, sticky ball forms. Remove the ball from the food processor, then roll into individual small balls, about 1 inch across. Sprinkle any desired toppings on individual plates, then roll the balls in the toppings to coat. Place balls on a parchment-lined baking sheet and freeze until no longer sticky. Transfer to an airtight container and store in the refrigerator or freezer. I am going to have to add this recipe to my ever growing snack collection! Yummm!! I could seriously pop all of these into my mouth right now. Lovely, energy boosting bites. I make a similar truffle with dates. I’m totally loving that these energy bites are made with golden raisins (my favorite)! I’ve made similar bites with dates before, but I need to try it with raisins next tim! I love that it’s balls in your mouth week! Sorry. Please don’t delete me. I love you. And don’t buy more golden raisins, I’ll send you one of the 3 bags I have in my pantry! Yay for “ball of goodness”!!! And these are filled with so much goodness!! Can it be “Shove This Into Your Mouth Week” every week?! LOVE these energy bites!! I just realized we didn’t take a photo together! :( oh well, next time! so good seeing you!! Have fun in Chicago this weekend! I do the same thing, which is why I have three different containers of cornmeal, three cans of chopped green chiles and two bags of peanuts in my pantry at this very moment. I am excited to try these. My toddler hates peanut butter (I know!) and most no-bake snack bites have it. Thanks! No peanut butter? Oh my goodness! I hope these healthy treats do the trick for you both Rebecca! Yum! I think I would keep these in the freezer to pop in my mouth for a healthy afternoon or late night snack. Love how healthy these are! 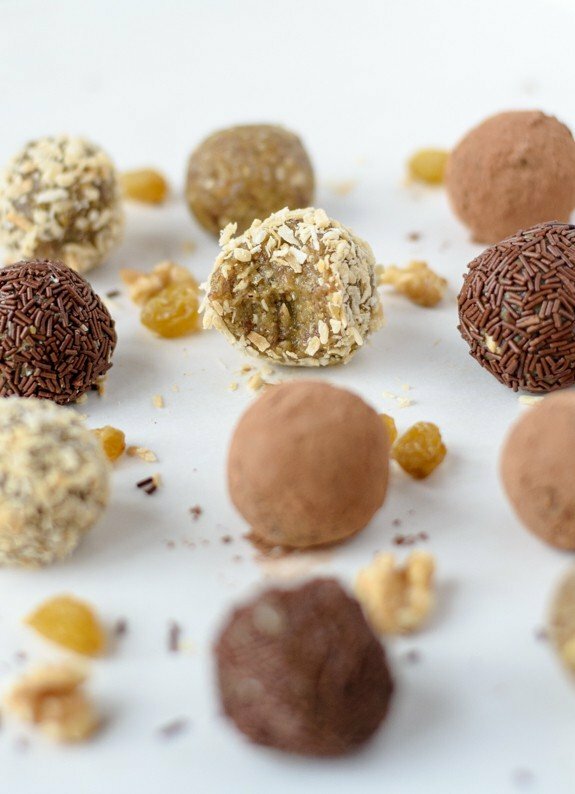 These are some of the prettiest energy balls ever! I almost never have raisins.,.I’ll need to change that and make these. These energy bites look so amazing! A perfect snack after a nice workout! I love having them for a post workout snack too. Thanks Christina! I pinned this, but under cookies and candy. They are delectable. I soooo understand about thinking you are out. I am embarrassed to tell you about how much oatmeal I found in my pantry this week. Good thing I use a lot of it. Hey there, Erin! Absolutely LOVE oats! These dessert balls are little energy bursts of awesome. Thanks for sharing this! I’m kind of tempted to sprinkle them with sesame seeds, though I’m not sure if the combination will go, haha! Also, it seems like our blogs share a similar kind of wife-related theme too. That is so cool! :) Haven’t encountered many food blogs of a similar vein. High five! Levan, so nice to virtually meet you :-) I love savory/sweet combos, so I’d definitely try the sesame seeds. High fives from Wisconsin! 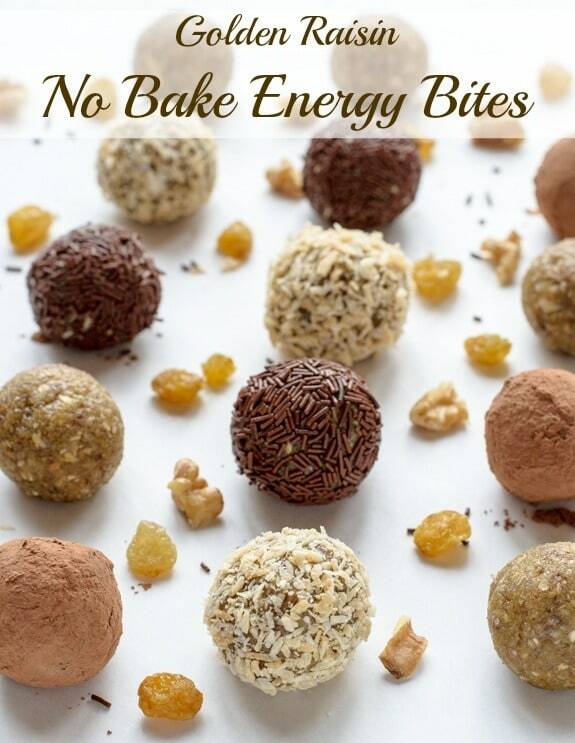 I love making energy bites like this to have in the house! Although I haven’t made any in months … whoops! haha These sound completely delicious! No! This is insane! I can’t even right now with how amazing these look!!!! Need to make these asap, pinning so I don’t forget!! Just stumbled across this recipe and whipped it up last night! How long do you leave them in the freezer to get them to the “not sticky” stage? I left them in for an hour and then put them in the fridge but they’re still super sticky this AM. Any ideas? Hi Kara! The balls shouldn’t be ultra sticky, just a little bit sticky My guess is that your raisins might have been extra moist or you might have added some extra honey, both of which would increase the moisture content. Ne t time, a few more oats will do the trick to get the dryer texture you were hoping for. With energy balls, it’s sometimes hard to get exact amounts, since dried fruit can vary in moisture content. Although they are a little sticky, I hope that they are still delicious to eat! You could try rolling them in toasted coconut or finely chopped nuts to make the outsides a little dryer if you like. Carrie, I’m so happy to hear you and your kids love these so much! I think apricots would be delicious. I’d cover them in very hot water, let them sit about 10 minutes to soften, then once they are cool enough to handle, drain and pat them dry. If the balls seem to dry when you are pulsing them, try adding a little nut butter or honey to thin them out a little. If you try the recipe this way, I”d love to hear how they turn out! I hope you enjoy them, Jade! Is the 98.7 g sugar correct? Or a typo? Hi Kellie, I’m not finding where you’re seeing 98.7 grams of sugar—that number seems very high per bite. If it’s from a site where you can calculate nutrition value, I’d definitely double check the ingredients that are pulling in. I know from personal experience with My Fitness Pal, for example, that some ingredients can be quite a ways off!